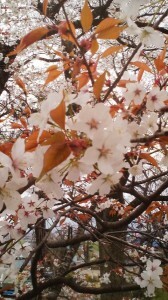 For more than a week now the cherry trees (sakura) in Tsukuba have been abloom. We`ve seen them in the parks, at schools, outside offices and research institutes, on roadsides, in the gardens of private homes, and at temples and shrines. Even indoors there is no escaping the pink blossoms – as in many shops or in the subway and train stations, we are often confronted with plastic branches bearing plastic blossoms put on display in celebration of the season. We have looked at them for afar and from way up close. We have sat under them, eaten and drunk under them- might have even sung and danced under them. Perhaps by day, perhaps by night, but more probably by both. 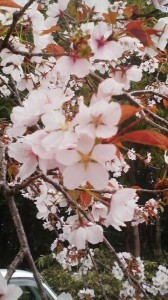 Many of us are already suffering from what the Japanese have long called HANA TSUKARE (花疲れ)- cherry blossom exhaustion. I certainly am. So why would we want to see more sakura- especially if we would have to travel more than an hour to do so? Well, the fact is that most of the cherry trees that you have seen blooming so far this season are a variety called SOMEI YOSHINO, which was developed only in the middle of the 19th century by the cross-breeding of two of Japan`s 9 native varieties ( the Oshima Zakura and Edo Higan varieties). 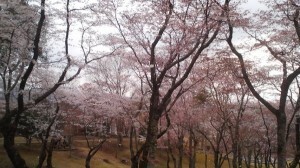 The ubiquitous SOMEI YOSHINO (染井吉野) , which now comprises about 80 percent of all the cherry trees in the Japanese ( and nearly all those which grow in Washington DC and New York), blooms a big, beautiful pink before its leaves come out. Even more importantly for its popularization is the fact that it blooms in unison with its surrounding brethren. By this I mean that in each area all the SOMEI YOSHINO will bloom at once- making it possible to create cherry blossom canopies over roads or to have parks full of trees in full bloom. It is also because of the consistency of this breed that the CHERRY BLOSSOM FRONT`s movement across the archipelago can be followed with such enthusiasm and anticipation by the public as it is reported day by day in the mass media. Traditionally, this was NOT possible. The trees which in their pre-history grew to be so important for the Japanese- as a manifestation of the Mountain Deity (Yama no Kami) which descended each May to the lowland fields to make rice production possible, the tree which became a symbol of spring and of youth, as well as a reminder to all of the passing nature of all things- was the YAMAZURA (山桜), the wild cherry which grows on mountain slopes a few weeks later than the SOMEI YOSHINO does now. And even more interestingly, since each wild cherry is genetically distinct, they do NOT bloom all together at exactly the same time- but bloom and then lose their petals at their own pace, tree by unique tree. The timing of the YAMAZAKURA`s blossoming just before rice transplantation ( a couple of weeks after the SOMEI YOSHINO) was significant for the farmers this was a sign that the Mountain Deity had appeared (on the mountains) and when all the blossoms had fallen ( after appropriate festivities were held) the transplanting would begin. The SOMEI YOSHINO bloom a little too early for compatability with this cycle and also are found mostly in the flatlands. The yamazakura LOOK very different from the SOMEI YOSHINO, as well. The main difference is in the fact that usually their blossoms and leaves emerge at the same time and thus when looked at from afar emit a mysterious glow ( quite different in mood from the SOMEI YOSHINO`S bright and abundant pink). But the fact is that since every wild cherry is unique- they each have blossoms of distinctive color, shape, and length of blossoming period. You can get a look at a wide range of surprisingly diverse looking wild cherries on the outskirts of the town of Iwase ( now a part of Sakuragawa City), about 29 km north of Tsukuba. This area has been renowned for its wild cherries for more than a thousand years. Once of Japan`s greatest classical poets refers to these trees in one of his works by referring to the Sakura River (Sakuragawa), which runs through Tsukuba City and then Tsuchiura, before it flows into Lake Kasumigaura. This river ( The Cherry River, if directly translated into English), which originates from a pond on a mountain in Iwase, derives its name from the numerous the cherry blossom petals which according to the poem would coat the surface of the river each spring after they had fallen from their trees. The fame of this area was so great that during the Heian Period it was said that for those who wanted to seek out SAKURA there was Yoshino in the West, and the Sakura River in the East. 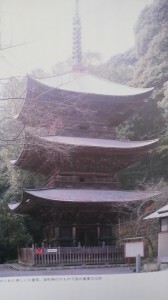 The great Noh playwright Zeami, also wrote of this area in his work appropriately entitled SAKURA GAWA. In later years, the Lords of Mito ( including the great Mito Komon) and the Shogun himself had saplings taken away from Iwase to plant in Mito and Edo, respectively. And then the SOMEI YOSHINO were developed and the world of the sakura changed forever. So if you are interested in getting a glimpse at what SAKURA really looked liked to the Japanese of yore- head on up to Iwase. You can go by car or by bicycle ( along the RINRIN ROAD), though if you opt for the latter mode of transpotation you will need at least a whole day and a very fit pair of legs! Along the way you will enjoy plenty of beautiful scenery with lots of wild cherries blooming far off in the mountains. The trees on the grounds of the Isobe Inamura Shrine are at various stages of bloom right now. I was there today, and met people who had come from afar and were staying nearby so that they could watch day by day the changes in the trees. There was even one variety which will supposedly change color- it is now pure white, but will soon change pink! 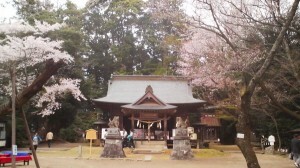 The mountains behind the shrine will probably be at their best for Cherry Viewing around April 27th. While there make sure to visit the beautiful 8th century temples Gassan-Ji (月山寺), on one moutain, and Tomiya Kannon (富谷観音), on another. For those with an interest in traditional Japanese culture, it is well worth the trip! It is a true JAPANESE experience. I mean, where else in the world could you find a guide taking rapt listeners from one cherry tree to the next for more than an hour explaining with great excitement ( and reverence) the fine points of each type of blossom! The Sakuragawa Isobe Inamura Jinja Shrine ( 櫻川磯部稲村神社) off route 50, is dedicated to the God Yamato Takeru no Mikoto ( one the conquerors of Eastern Japan for the Yamato Court), as well as more than ten other deities.Locals have traditionally prayed there for easy delivery, household safety, and for passing entrance exams. Of interest, to the back the main hall on the left, is a KANAME ISHI (要石) like the more famous one at the Kashima Jingu (Grand Shrine) which was believed the suppress the violent writhing of the great earthquake causing catfish (NAMAZU). While the stone in Kashima holds down the immense subterranean fish`s head, the one in Iwase is said to restrain the tail. Local residents credit the lack of major damage to their town in the earthquake of March 11th 2012 to the work of their Kaname Ishi stone. Cherry Blossoms by night (yozakura) – and then by day -night again! Thanks Avi-san your sound introduction about SAKURA! I like Sakura, Momo (peach), and Ume flowers, and their shapes too. Also I am fond of SAKURA-SAN(movies, famous TORA-SAN’s Sister played by actress Baisyo Chieko more than 30 years) who always took care of her naughty brother. English title version TORA-SAN DVDs can be rent from Tsukuba central library. There were a few ladies whose name were Sakura. Momo,Ume,Matsu(pine),Take(bamboo) too. In this season I always enjoy “SAKURA-YU” (salted cherry flowers in hot water), cured a year before. Smell and color is so nice that I always remember my wedding ceremony, there it is served like tea as symbol of happiness. Try to make salted SAKURA flowers using Yae-Sakura(Those will bloom near May around here with pinkish color flowers of multi-petals), for Sakura flower viewing of next season or for someone’s wedding party or anniversary! I didn’t know you could preserve yaezakura to make sakura-yu. How do you do that? I love sakura-yu; I make jelly with the preserved sakura as it’s a bit salty to drink. Oh, how do you differentiate between momo and yaezakura. Both have many petals. 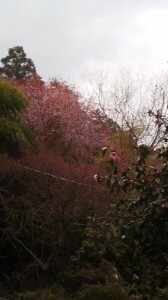 I notice that a momo tree is shorter and the colours are darker pink than yaezakura. 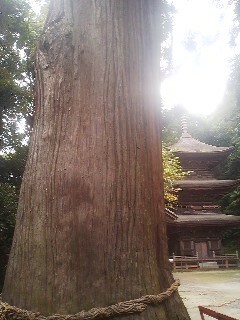 One more thing I observed about sakura and could tell it from a ume tree is the bark on the trunk and the branches. 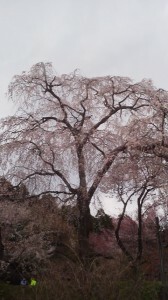 There are short stripes on sakura trees. But I am not too sure about momo. I have come across white sudare momo in my neighbourhood and I thought it was sakura (the bark had a few stripes on the branches but at the same time the barks seem rough and peeling off). It was only I asked the owner and when it bore fruits last year that it is a momo tree after all. 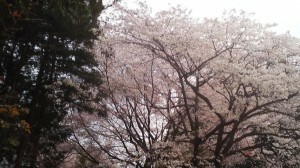 It bloomed later than someiyoshino and around the same time or a bit later than yaezakura. I can’t tell the difference between yamazakura and someiyoshino. Are they the whitish flowers with the new leaves sprouting at the same time? ＊Sakura Vs Momo →I cannot detect them by skin of trees, shapes of Momo tree are usually made shorter for easier picking of fruits. Flowers of Momo connect almost directly to the branches (like Yakitori-style.-*-*-*-*-*-*-*). Momo-iro(color of momo) is pink, I am not sure because many Momo flowers are pink or their fruits have pinkish parts).We sometime say that Kids have Momo-iro cheeks. ＊Yamazakura Vs Someiyosino→Someiyoshino:flowers first come then leaves, while Yamazakura flowers and leaves come simultaneously. In the book they say there are more than 600 Sakura breeds!! (artificially made). Somei-Yosino was bred during Meiji Era by Gardeners in Somei district in Tokyo and named after Yosino in Nara where Yamazakura had been very famous from 1000 years ago. Those gardeners did not use Yamazakura for breeding Someiyosino. ＊Method to make Salted Sakura flowers→Recent Article of Avi-san’s explained detail. My case, I just pick buds and flowers and cured with salt by my instinct. Mountain cherry was just superb!